You can see in Susan Beayni's eyes just how much she loves her daughter, Rebecca. Love, contribution, friendship and community have been the pillars upon which Susan has built her personal and her professional life. My interest is in how longterm caregivers use their experience to teach, to inspire and sometimes, to create a career. Susan Beayni is the Coordinator of Family Supports at Partners for Planning in Toronto, Canada - she taps into the wisdom she's gained from her own caregiving to advise and support others. Susan Beayni is the mother of two young women - Rebecca (31) and Nicole (28). Rebecca lives in her own apartment that adjoins the family home where Susan and her husband Simon reside. Susan and Simon tell their story of nurturing a good life for Rebecca in a marvellous video titled DANCE IN THE SHADOW (viewing the video is free on the Partners for Planning site, you just have to register first). Even as a girl growing up in Ontario, Susan felt a connection and a calling to Africa. In 1979, she travelled to Nigeria as a newly graduated teacher and there, she met her husband to be. Simon Beayni hailed from Lebanon and when the couple married, they left Nigeria and returned to Simon's birthplace. Lebanon in 1980 was under siege and when Susan fell pregnant with Rebecca a couple of years later, she boarded a British container ship carrying evacuees to safety in Cyprus. Eight months pregnant, Susan made it eventually back to Canada in time to deliver Rebecca in Toronto. 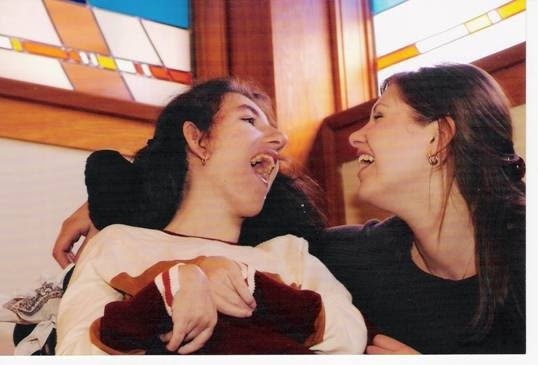 Not wishing to be separated from Simon, Susan flew back to still war-torn Lebanon with her new baby and slowly, it became clear that Rebecca had disabilities. Rebecca had suffered the effects of a virus contracted early in Susan's pregnancy. "In the midst of so much hatred, our baby girl was our peaceful anchor", Susan says. "She changes the whole fabric of the environment. She calms people down - she makes people joyful and grateful. Her fragility and vulnerability are her greatest gifts. She gives others the permission to be vulnerable, too." I asked Susan about her own professional life and aspirations as Rebecca's mother, over time. At first a full-time mother ministering to her two children's daily needs, Susan tried supply teaching when her girls were teenagers. But, working proved difficult with Rebecca's many medical appointments and unpredictable illnesses. Then, as luck would have it, an opportunity to use her knowledge and skills presented itself. A professional committee was being formed at Holland Bloorview Kids' Rehabilitation Hospital to assist families transition from children's services to adults'. Susan was hired on a five year contract to gather information about families' needs and to develop a curriculum and resources. When that contract ended, Susan reflected on what form her future contributions might take. "I just want to be with families," was her conclusion. When Susan met Jeff Dobbin, the Executive Director of Partners for Planning (formerly PLAN Toronto), she knew that she had found a match. Jeff's talent was in applying the business approach to assisting families build a safe and secure future for their son or daughter with disabilities. But he needed someone with the skills, knowledge and wisdom to support families in building support networks as well as offering them information and compassion. Susan was hired. Now, Susan draws her own strength from her exploration of indigenous peoples and their traditions of acceptance and inclusion. She says, "From the time Rebecca was born, I worried that she would die. So, I finally came to rest in the unknowingness - in the unpredictability of our life course. I embrace the African idea of Ubuntu that Nelson Mandela described so well." 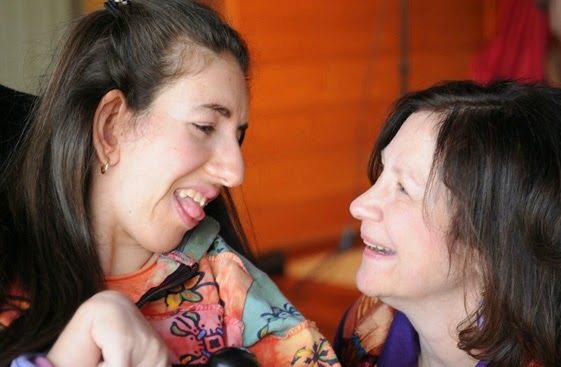 Susan Beayni's life as a caregiver has led her from a dream of Africa, to mothering a young woman with severe disabilities to inspires her many friends and neighbours to be fully human, to eventually finding a role in teaching and supporting other families. Susan's life is rich and full of love and meaning. Her story nudges us all to readjust our lens of hope and expectation in life - it is not impossible to embrace the 'unknowingness' we all experience every day. NOTE: Partners for Planning is a fantastic resource for families supporting a loved one with disabilities. I urge you to check it out! To read more about Rebecca Beayni and her extraordinary life and community contributions, check out her WEBSITE.